Sister Elizabeth Bagen, Sister Daniel Marie, Sister Betty – was a Buffalo girl born to Daniel and Margaret Bagen more than 80 years ago. A Holy Angels girl, she worked at Sattler’s after graduation before coming to the Grey Nuns of the Sacred Heart in 1954. (Weren’t we lucky!) In the first ten or so years of life as a Grey Nun, she earned her degree at D’Youville, studied for her masters in theology at Villanova, and taught 1st and 2nd graders in Buffalo, Atlanta, and Melrose. First with the little ones, and later, with adults, she helped satisfy hunger and thirst for knowledge, for truth, for prayer, for understanding, for God. I think Betty would have been pleased with that choice. She needed that reassurance in so many of the challenges of her life. She had been finally professed only four years when she was asked to become mistress of postulants. These days, she might have had extensive training for such a ministry, but Betty came into it totally unprepared just as Vatican Council II and worldwide paradigms were shifting and turning the church upside down. I imagine she asked God more than once to take her by the hand and help her. I met her for the first time in 1964. I remember thinking, “I wonder who this one is and what she’s doing here?” as we were marched off to whatever was next after donning the postulant outfit. Because I had had a few years in college, I was often available for trips with Betty. One trip she loved to remind me of was to the emergency room at Holy Redeemer Hospital with one of my companions, who cut her head enough to need stitches when we were roughhousing. I went with Sister Daniel Marie and Peggy. When the nurse inserted the needle for the first stitch, I fainted. I guess I hadn’t moved into being happy in my vocation yet because Betty told me I had a look of horror on my face when I opened my eyes and saw her looking down at me! Poor Betty. Betty helped a lot of Grey Nuns navigate through those years of change. She had a great sense of humor and she loved to laugh. She was very real – that big laugh of hers helped her and lots of us through some crazy times. Betty loved the Beatitudes and believed that they are the heart of the gospel. She lived the blessedness of those who mourn – having said farewell to her dear sister and much later to her brother; to good friends – Mary Gregory; Michael; Christina Mary; Mary Peter; even to her dog, Sweety Pie, and just recently to her childhood Buffalo friend, Nick. Marlene told me that when she talked to Betty about Nick’s passing, Betty said, “I’ll have a good cry.” Like many of us, Betty also grieved about leaving places and people she learned to love, but wherever she went next, whatever the ministry, she embraced the people with her whole heart. Connie and I visited Sisters Betty and Michael of the Sacred Heart when they were missioned to the Allentown diocese up near Mahanoy. I remember how happy they were, and how happy the parishioners were, to have Sisters back helping them. She and Michael epitomized the gospel passage, “I was sick or in prison and you visited me” – initiating outreach to the sick, the homebound, and the elderly, maintaining ties with faithful women and men in five parishes in the coal country where the Church was so needed as sacrament of Jesus’ healing presence. Betty loved scripture and loved sharing her love of scripture with others. One of the parishioners at St. John of the Cross where Betty lived with us for six years wrote in an e-mail that she felt that the experience of scripture sessions with Betty had profoundly influenced her reading of scripture now. Dear Sister Betty, you have welcomed all of us into your parish family, your ministry, and your heart, and you have consistently shown us the hospitality which flows from a truly ecumenical spirit. You have shared with us in worship and prayer and service, and you have been helpful and cooperative in more ways than we can remember. We give thanks to God for your kindness and your gentleness, your caring and your love. . . . our love and our thanks go with you. We don’t know if Betty knew, as Paul seemed to, that the time for her departure was near. We can be a little jealous of her since it seemed so easy for her to leave us, but we can’t know what it cost her in these last years to be unable sometimes to remember, to get things straight, to go where she wanted to go, and to take care of herself. She was poured out like a drink offering often enough, and yet she was always grateful for the care she received. It seemed that she never stopped believing those words from Isaiah’s God. Go now in peace, faithful friend of God. We loved you! Sister Elizabeth (Betty) Bagen, GNSH, 81, died September 1,2017. Born in Buffalo to Daniel T. and Margaret (Jackson) Bagen, on September 10,1935, Margaret Elizabeth Bagen entered the Grey Nuns of the Sacred Heart in 1954. Sister Betty earned a BS in Education from D’Youville College, an MA in Theology from Villanova University and an MA in Pastoral Ministry from Iona College. Her early ministry was serving in the classroom, teaching primary grades first in Holy Angels School in Buffalo, then in Atlanta, GA and Melrose Academy, Melrose Park, PA. For the remainder of her religious life she worked with adults both in the Congregation and elsewhere. From 1968-1971 she was assigned to D’Youville College in Buffalo, NY, where she was Director of Residents after a year of teaching Theology of Revelation. In 1971 she was elected to Congregational Leadership and again in 2003. She had previously served in the Grey Nuns of the Sacred Heart Initial Formation process as Mistress of Postulants and Assistant Mistress of Novices for six years. From 1975 to 1982 she served five Catholic Parishes for Catholic Charities in the Allentown Diocese in pastoral ministry to the elderly. Moving to Virginia, she served in parish ministry for 21 years, first as Minister of Religious Education at St. Andrew’s Parish, Roanoke and then as Pastoral Coordinator at Resurrection Parish in Moneta. 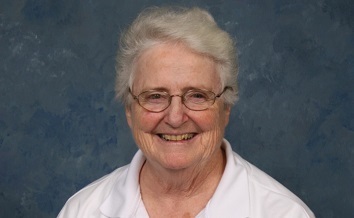 Retiring to the Motherhouse in Yardley in 2008, she continued to serve in various ways prior to moving to the Magnificat Community of the Sisters of the Holy Redeemer in 2015, where she lived until the time of her death. Sister Betty is predeceased by her parents, a brother and a sister. In addition to her religious community, survivors include her sister-in-law and several nieces and nephews. A viewing will be held at 10 AM on Saturday September 9, 2017 in the Holy Redeemer Sisters Chapel 521 Moredon Road, Huntingdon Valley, PA 19006 followed by the funeral liturgy at 10:30 AM. Burial will be in Resurrection Cemetery, Bensalem, PA. In lieu of flowers, memorial donations in Sister Betty’s memory may be made online to the Grey Nuns of the Sacred Heart. Messages of condolence and memorial donations may also be sent by mail to: The Grey Nuns of the Sacred Heart, 14500 Bustleton Avenue, Philadelphia, PA 19116-1188. Funeral arrangements by Beck-Givnish Funeral Homes, Inc.
Aunt Betty was my Moms younger sister. She was an awesome lady. She was honest and told you what she thought and I appreciated it. My Gram was so happy when she was in the Buffalo area and looked forward to her visits when she wasn’t close by. Aunt Betty took great care of Gram when she was here. We always looked forward to her visits. She was my Confirmation sponsor. I truly love my aunt. Sad that she is gone and I can’t get to her funeral due to hurricane Irma.